The LG 29UC97C is an ultra wide monitor with a 29″ screen size brought to us by Korean manufacturer LG. Ultra wide monitors are becoming more popular with more and more manufacturers releasing game ready quad HD 34″ screens onto the market but many of us simply don’t have the graphics card power to run these screens, nor the budget to buy them in the first place. This 29″ 1080p monitor is a good compromise for anyone with the heart set on an ultra wide monitor but doesn’t want to go all out to run a higher resolution gaming rig. This actually makes a lot of sense because for many people HD is still plenty good enough. It will be roughly the same height as a normal 24″ screen, so if you are happy with that size and feel no need to upgrade from HD then this monitor could be the one for you. The 29UC97C comes with a solid stand with an attractive metallic finish, the overall feel of the monitor is of a clean and modern build. The whole thing is sturdy enough, note that the stand needs some assembly but its just four screws and it’s easy enough to fit together. The stand adjustments are limited, you can tilt but that’s about it. In terms of connectivity you get HDMI and DisplayPort sockets, there’s also a headphone socket and built in speakers. As is typical with monitors, the speakers are nothing special but they are better than nothing if you don’t have a sound system in place to hook up to your gaming rig. You also get a couple of handy USB 3.0 ports to play with. The bezel is very thin at just 2mm which I always think improves the look of a monitor, but note there is also a thin border around the panel itself which some may find distracting. Most people won’t be bothered by this but it would be noticeable if you were trying to position two together for a mega visual surround experience. The LG 29UC97C has a versatile screen, the IPS panel gives bright vivid colour reproduction and viewing angles – which you need with the ultra wide format! The extra screen space is really handy for running applications and a nice addition when gaming. The extra periphery vision helps you see those online enemies before they can see you! The 5ms response time makes this acceptable for gamers, and whilst the ultra wide screen format does mean there are more pixels to push around it won’t strain your graphics card in the same way as a QHD ultra wide. This is worth bearing in mind, if you don’t have a top of the range GPU then this monitor is a more suitable choice as you should still get decent frame rates, similar to a standard width 1080p HD screen. Moving to 1440p or above comes with a real hit! That said, the most demanding gamers may be looking for the extra game ready features such as fast refresh rates and adaptive sync. If that’s the case then this monitor may not be for you but then if you want to step up to the next level you’ll need to play. If you are looking for an ultra wide screen gaming monitor that is good enough then this is well worth your consideration. We give the LG 29UC97C a 4 out of 5 rating. Want to know what existing owners of the monitor think? You can read real user reviews here. 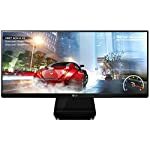 Should I buy the LG 29UC97C? Welcome to the LG 29UC97C FAQ. This section attempts to answer common questions you may have, please get in touch if you have any more queries or if you think our answers need updating. What colour is the back of the monitor?